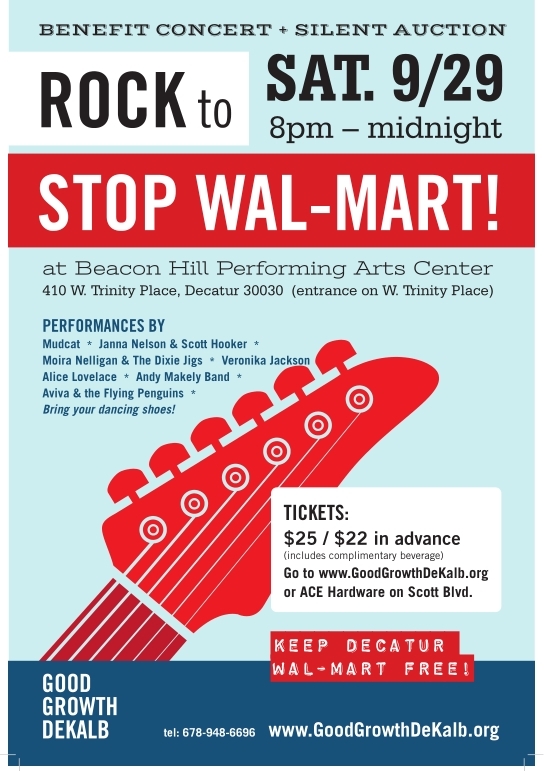 Rock to Stop Walmart a resounding success! THANK YOU to everyone who helped make this happen, including the wonderful performers, stagehands, those who donated to the silent auction, our graphic designer, all the volunteers who helped coordinate and promote the event and, of course, everyone who came out for this fantastic evening. Doors open at 7:00 p.m. — get there early to bid on your favorite items! Andy Makely Band: electric blues, great horns and dance music to wrap up the night! Gift Certificates to Ted’s Montana Grill, Parker’s on Ponce, Leon’s, Shield’s Meat Market, Rainbow Grocery and more! Six nights at Windermere House on Hilton Head; six nights in a beach-front condo in Destin. Tickets to “Empire Brass” at Tech’s Ferst Center; Sergio and Odair Assad on classical guitars at Emory’s Schwartz Center; “A Christmas Carol” at the Alliance, August Wilson’s “Two Trains Running” at True Colors Theater and more! Etchings by Victoria Webb and Bill Coombs; acrylic and charcoal by Helen Durant; sculpture by Valerie St. Jean Gilbert and more! Seven necklaces of sterling, agates, pearls made by Isabel Jones; hand-made purse by Jean Cohen and more! Gift Certificates at Soul to Sole Reflexology, Core Body, Fleet Feet Sports and more! Gift Certificate from Michael de Give Home Repair; pillow covers from Sara Lee Parker Textiles and more!